Ceylon or as it is known today Sri Lanka is a large Island in the Indian Ocean below India. Large areas of Ceylon are flat plains but to the south of the Island the mountains rise up to a height of over 8,000 feet. It is in and around the mountains that the main tea growing districts lie. Since the 19th Century Ceylon Black Tea has been synonymous with the growing of tea and today Sri Lanka is often called “The Island of Tea”. The first tea plants were introduced in the 1820's from China and later seedlings arrived from Assam and Darjeeling in India. The first commercial tea plantation enterprise was started in 1867 by a young British Tea Planter James Taylor, the plantation was called Loolecondera in the Kandy district. Tea production is a main part of the Sri Lankan Economy, with over one million people working in the industry. In recent years Ceylon has produced between 330 and 340 million kilos per annum. The climate in the highlands lends itself to growing tea with cool temperatures and good amounts of rainfall. As with many other parts of the world the high grown mountain teas are regarded as some of the best, like Darjeeling in Northern India and the tea from the Wuyi Mountains of Fujian in China. To a large extent tea in Ceylon is still picked by hand, two leaves and a bud is the freshest and the best. he colour of the leaf changes from fresh green to the bright dark copper colour that we know as tea. The tea is then fired to halt the fermentation. The tea is either cut to achieve finer smaller leaf grades suitable for making tea bags or not cut where the leaf is whole and of the highest quality. Finally the teas are packed. In the early years loose leaf tea was packed into the old fashioned tea chests which only recently have been phased out in favour of thick foil lined paper bags. In Ceylon the main auction for tea is held in the Capital of the Island, Colombo. Then shipped to the main world markets of Europe and America. 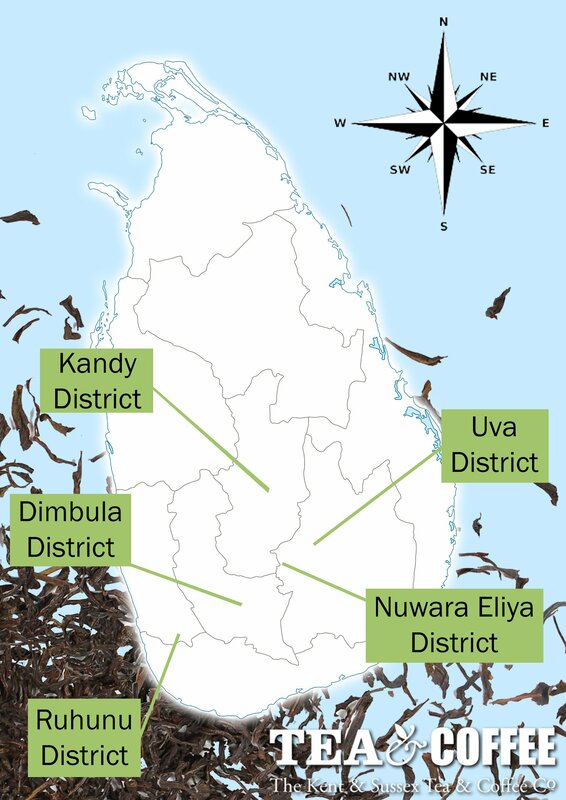 There are several important main tea growing districts in Ceylon. Kandy, Dimbula, Uva, Nuwara Eliya and Ruhuni. Each district produces its own teas with unique flavours, aromas and tastes. Lies to the northern side of the central highlands with plantations found at altitudes of up to 4,000 feet. The first cultivation of Tea was in Kandy so tea has been growing there for over 150 years. Kandy Teas are known for producing Black Tea with a bright liquor in cup, dark copper in colour and a strong full bodied taste. One of the best tea gardens of the area is the Sylvakandy Tea Estate which produces a very fine OP (Orange Pekoe) grade tea. is an area with an altitude of between 3,500 feet and 5,000 feet, with a south western aspect. It includes certain well known tea districts such as Dickoya and Bogawanthalawa. Tea has been cultivated in the Dimbula Tea district since the 1870's and are regarded as high grown. In cup the colour of the liquor is a golden dark orange with a refreshing aroma and taste. The early tea planters were often British with the Scottish leading the way, as a result tea estates often had Scottish names, one particular estate that we stock is called Kirkoswald from which we currently have stock of a very good FBOP (Flowery Broken Orange Pekoe). Lies in the East of Ceylon's High Plateaus in the wilder part of the island. Here the tea estates range from 3,000 feet to 5,000 feet above sea level and produce a variety of tea grades and qualities of Uva Teas. The weather plays an important factor with that side of the island being exposed to both northerly winds and the impact of the south westerly monsoon systems. A rugged landscape gives certain tea estates a unique advantage, for example the Indulgashina tea garden is at a higher than average altitude and benefits from drying winds, here they produce Black Tea and Green Tea. Our Indulgashina Organic is a very good example of the estates quality production. The highest part of Sri Lanka at around 6,000 feet above sea level. Known for producing the best quality Teas on the island. This high plain was colonised by the British in the 19th Century and became a hill retreat for tea planters and civil servants. The warm temperate climate is cooler than at lower levels and lends itself to producing excellent high grown loose leaf teas. Characteristic Golden colour in cup with aromatic and delicate flavours. The best grades grown in Nuwara Eliya are the smaller cut leaf BOPs (Broken Orange Pekoe) and the whole large loose leaf orthodox teas OP1's (Orange Pekoe). We quite often get asked for or What is ? “Ceylon Orange Pekoe Tea”, the answer is that it is a grade of Tea. One of the best Ceylon Tea Estates in the Nuwara Eliya district is the Lovers Leap Tea Garden, named after a tragic love affair. Are lower lying districts to the South West of the Island. A land of low hills and plains, good soils and a favourable climate creates a very fertile environment for growing Teas. As you travel towards the east the terrain turns to Jungle historically inhabited by wild life including Elephants, Leopards, Wild Boars and Bears. Today several game reserves exist to preserve the wonderful nature of Sri Lanka. Tea was only introduced to the area in the 20th Century and has increasingly become known for producing strong black teas full of punch and flavour, popular grades for tea bag manufacture which now equates for the bulk of tea production from Ceylon / Sri Lanka. We have in stock from this area a good Orange Pekoe-1 (OP1) grade tea from the Lumbini Tea Estate and a very top quality Special Flowery Orange Pekoe (SFOP) production from the Ratnapura Tea Garden. Here at The Kent and Sussex Tea and Coffee Company we stock over 60 different Ceylon Teas from across the island. From each district we stock a house Ceylon Orange Pekoe and a house Ceylon Broken Orange Pekoe. Also we stock many single estate original teas, these can vary throughout the season and from year to year. Every year qualities of teas from estates can change, we always buy our teas to taste so sometimes a particular estate can be out of stock for that reason. We pack our own Pluckley tea bags here at our Pluckley factory, also available are our “Ceylon Tea Bags”.